Welcome to the new-style Riding Safely newsletter! We've been going for just over four years, so we decided to change the format. If you've missed us in your Inbox lately, that's because we wanted to get it right. Meanwhile we've gone on producing monthly reports, and you can catch up with them on the Past News page. But if you're pressed for time, we'll still be bringing you up to date on the key news reports of 2008. We now report on more global issues - health, safety and welfare are common issues wherever you are. Other countries have much to share in this respect, and Riding Safely will be bringing you all we've learned from them. And on that score, we'd like to welcome our new subscribers from around the world, particularly those in the US, Australia and New Zealand. Remember, we don't just report the news. We try to provide solutions as well. Hopefully, together we can make the horse world a better place for everyone, including our equine friends. Dark winter months are attractive times for arsonists to strike. Over the past month we've seen two suspected attacks. Go to our FIRE section to find out how to protect your premises from arson while picking up winter fire prevention tips from equestrian fire specialist Harry Paviour. Highly respected, leading FEI vet Bob Baskerville is at home recovering after surgery following a kick from a sedated thoroughbred. Speaking to Horse & Hound he said: "I consider myself to be very lucky this time, but would like to remind everyone not to become complacent when working around horses — especially their feet". I'd like to wish Bob a very speedy recovery. Leaving aside his particular case, I'd echo his thoughts. Riders, owner riders and professionals sometimes become complacent around our four-legged friends. There are many reasons for the unfortunate accidents that happen to our horses and riders. Let's make sure that complacency isn't one of them. The parents of a four-year-old with a rare genetic disorder say he is being helped by horse riding. Dyfan Wynne, from Wrexham, is the only known child in Britain with the condition called 'Chromosome 8 deletion'. It has left him with poor eyesight, learning difficulties and the need for heart operations. But hippotherapy, physiotherapy on horseback, has helped him learn to walk and increased his self-confidence. The youngster progressed so well with the hippotherapy sessions that he is now in the 'vaulting' classes - effectively gymnastic movements on horseback. Dyfan's mother Helen said the treatment for her son has changed his life. The RDA is launching a new programme to boost the number of its volunteers. Stable staff at racing yards are to get higher wages from November and an increase in holidays. Redwings Horse Sanctuary offers some money saving tips to horse owners as the UK economic situation worsens. Horses with cancer have a better chance of recovery thanks to the extension of a cancer therapy unit at the University of Cambridge. The Queen's Veterinary Hospital at the university is the only facility in Europe offering radiotherapy for horses. Last week it opened a new building to house a radiotherapy machine designed to treat animals. Laddy, World Horse Welfare's one-eyed horse appears in the new book Equus by photographer Tim Flach. An American Judge has sentenced a woman who pleaded guilty to three counts of first-degree animal cruelty to nine months in jail for mistreating her horses. Two teenagers have admitted shooting two Shetland ponies at a care home in May. A horse was fatally wounded after being shot in the neck in Godstone on 24 September. Anyone who is 16 years and over who has access to horses and equine facilities can take part. You’ll also need a competent person (Level 3 – e.g. AI)) who can observe you undertaking some basic but key practical activities with horses. The course fee is £40 and this includes registration fees and all necessary learning and assessment materials, however if you are between 16 and 18 years old the course is absolutely free. Everyone will be able to access their own Equi Study Tutor to help them complete their course. 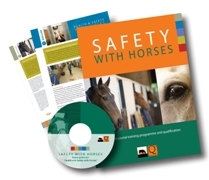 Click here for more information on the “Safety with Horses” campaign. Hunts across the UK express their relief that, following a hat safety review, staff can continue to wear a Patey if they choose. The US Polo Association is the first in the world to set rules over headgear for the sport. Riders in North Yorkshire have called for action to slow down drivers following a series of accidents. The Queen's granddaughter was taking part in a cross-country event at Pau near the French Pyrenees on Saturday (25 October) when her horse Tsunami II fell at a fence and broke its neck. Her spokesman said she was 'devastated' by the horse's death. Cross-country course designers and engineers are teaming up in the US to develop safer jumps to help prevent serious horse and rider injuries and deaths. Course builder and designers, including US Equestrian Federation President and licensed course designer David O'Connor, will join with faculty and students at the University of Kentucky, forming a multidisciplinary team to develop and demonstrate additional frangible technology for cross-country fences. The FEI is considering introducing licences for four-star riders under plans to improve levels of safety in eventing. Two horses in Texas, one of them in Denton County, have been diagnosed with Eastern Equine Encephalitis. The Denton County horse had been vaccinated. According to information from the Texas Animal Health Commission, Texas is one of seven states where EEE has been reported this year in horses. The disease is spread by infected mosquitoes and can be transmitted to humans. Horses with mosquito-borne encephalitic viruses such as EEE, Western Equine Encephalitis, or West Nile Virus may stagger, appear confused, and act erratically. “The disease is not so much killing the horse, it’s what it may cause the horse to do, (such as) fall over or fall asleep while drinking and drown,” said Dr. Dean Hansen, of the Little Elm Breezeway Animal Clinic. In 2002 when West Nile Virus was first detected in Texas, 1,699 equine animals were stricken with infection. West Nile vaccine has helped cut those case numbers from 716 in 2003 to two cases in 2008. “Vaccinating against mosquito-borne diseases has to be a part of routine equine health care. Don’t stop just because case numbers drop,” Schwartz said. “As good as vaccines are at protecting against infection, there are rare times when a vaccinated animal will still contract disease. That is no reason to avoid vaccinating your animals,” he added. The chairman of the Pony Club has extended the organisation's deepest sympathies to family and friends of Jade South, the 15-year-old member who died at a rally on 30 October. Jade, from Linton, Ross-on-Wye, was crushed by her 16hh horse Oz in a rotational fall at a South Herefordshire and Ross Harriers Pony Club Rally, held at Pauntley Court Farm cross country course in Gloucestershire. Kate Ludden is warning other owners to be vigilant after her horse was hit by a car after gates were left open allowing him to stray on to the road. UK: Racehorse dies of heart attack on gallops and crushes rider Work rider Michelle Bentham is recovering from being crushed when the horse she was riding collapsed due to a heart attack. A bus driver who hit and killed a horse being ridden on Dartmoor with a minibus full of children is wanted by police. Officers in Tavistock said a white private hire minibus had hit a horse at the local beauty spot known as The Rock on the Crapstone Road in Yelverton between 3.30pm and 4pm on Wednesday 15 October. Network Rail has dismissed claims that it was to blame for the death of a horse by refusing to switch off the electricity current on a railway. A six-month-old cob called Husher was electrocuted after falling on to the track between Aldershot and Farnham in Hampshire on 28 September. A Police horse was injured after being involved in a collision with a Range Rover in Rochdale town centre. Three people were injured when a horse-drawn carriage dramatically overturned after two of the animals pulling it bolted, flipping the coffin into the street. The hearse, carrying the coffin of Caroline Thompson, 79, struck a street bollard and careered into cars after two of the four horses pulling it darted away. The startled horses fled the Ipswich street before being recaptured 15 minutes later. One person was treated in hospital for a bruised hip and broken nose, while another two escaped with minor injuries. A rider whose horse was electrocuted by a damaged cable has spoken of her disgust that the company responsible have not been prosecuted. A 50-foot transport trailer carrying 44 horses tipped over on Deerfoot Trail killing 12 horses. Residents are worried that a serial arsonist might be on the loose after two pet dogs were burnt alive in a suspected arson attack at a stable in Clydach. Two horses were led to safety by their owner after a suspected arson attack on their stable. Ü 2/11/08 Latest News - Welfare, Rider Protection, Horse Attacks, Campaigns and Seasonal (Fireworks) Sections updated. Rider Protection and Horse Attacks pages added. Links page updated with details of The Laminitis Clinic. Ü 30/10/08 Latest News - Fire and Seasonal (Fireworks) Section updated. Ü 29/10/08 Latest News - Eventing, Other News and Accident Sections updated. Eventing page updated. Ü 27/10/08 Latest News - Eventing Section updated. Eventing page added. Ü 26/10/08 Scrolling news ticker updated. Ü 25/10/08 Latest News - Training Section updated. Training page added. Ü 21/10/08 Latest News - Fire Section updated. Fire Prevention page added. An award winning horse was rescued by local firefighters after it fell down a 12ft ditch between a wall and a stable building. An increase in the national minimum wage from £5.52 to £5.73 an hour for adult workers came into force on 1 October 2008. The statutory hourly rate for 18 to 22-year-olds has also risen from £4.60 to £4.77 and for 16 and 17-year-olds has lifted from £3.40 to £3.53. The rise comes with a warning from the government that it is proposing stricter penalties for bosses who fail to pay. Olympic eventing team trainer and former Olympic gold medal-winning horse rider Yogi Breisner has been given The Queen's Award for Equestrianism by the British Horse Society (BHS). The Princess Royal presented Yogi with the award at Buckingham Palace yesterday (16 October). Yogi was chosen by the BHS board of trustees "for outstanding services" to the horse world. BHS chairman Patrick Print said: "Yogi is unquestionably one of the great equestrian trainers of our time. Heroes in the field of equestrian safety were honoured at The British Horse Society’s Sefton Awards, held at the Household Cavalry Mounted Regiment's Barracks, Knightsbridge, London. The awards mark outstanding contribution in the field of riding and road safety. They can go to anyone who, through their achievements, has raised awareness of the need for riding and road safety. This year there were two recipients of the prestigious award, Alison Brown from Sinnington in Yorkshire and Rose Horrex from Gwent, South East Wales. It was not Fat Boy the pony's best night. First he ate so many fermented apples that he became drunk. Then he staggered across a garden and tumbled into a swimming pool. Unable to extricate himself, he had to endure the final embarrassment of being hauled out by the fire brigade.